Storing all of your favourite fresh and frozen foods is easy with this 22.1 cu. ft. bottom-freezer refrigerator, featuring SpillGuard glass shelves that help contain leaks and spills for quick cleanup. You'll be able to keep food at the right temperature thanks to the Accu-Chill temperature management system and Adaptive Defrost, which sense and adapt to activate the compressor and defrost cycle only when necessary. And to keep fruits and vegetables tasting great, the FreshFlow produce preserver helps keep produce fresh longer in your bottom-freezer refrigerator. Everything You Need...and Want You need to keep your food fresh, and you want all the storage solutions to make it easy. With 22 cu.ft. capacity, smart storage solutions including a folding door bin for extra tall items and LG's Smart Cooling Technology to keep your foods fresher, longer. You will be able to satisfy all of your storage and freshness needs. Powered by the Linear Compressor with a 10-year warranty so you can feel good about your choice for years to come. The inventors of the Door-in-Door bring you the French door with more! With generous 25 cu. ft. capacity, this refrigerator provides customizable capacity for even more ways to use your space. From post-workout protein shakes to after-school snacks, LG's Door-in-Door design keeps all your favourites at your fingertips while reducing cold air loss by up to 47% to help keep foods fresher longer. 22.1 cu. ft. Refrigerator with Bottom Mounted Freezer and SpillGuard Glass Shelves in White - ENERGY STAR® Storing all of your favourite fresh and frozen foods is easy with this 22.1 cu. ft. bottom-freezer refrigerator, featuring SpillGuard glass shelves that help contain leaks and spills for quick cleanup. You'll be able to keep food at the right temperature thanks to the Accu-Chill temperature management system and Adaptive Defrost, which sense and adapt to activate the compressor and defrost cycle only when necessary. And to keep fruits and vegetables tasting great, the FreshFlow produce preserver helps keep produce fresh longer in your bottom-freezer refrigerator. 22.1 cu. ft. Refrigerator with Bottom Mounted Freezer and SpillGuard Glass Shelves in White - ENERGY STAR® is rated 4.6 out of 5 by 6291. Rated 5 out of 5 by Christina from It's a good refrigerator. The door is a bit... It's a good refrigerator. The door is a bit "wonky". It shuts securely, but the minute you crack it open it flies open so fast and crashes into the cabinet really hard. Weird, right? I'm sure it's just this model, but we have to warn all visitors about our murderous refrigerator door. Rated 5 out of 5 by Ness from Overall I'm very pleased with my purchase. It's beautiful, spacious, quiet and the price was ri... Overall I'm very pleased with my purchase. It's beautiful, spacious, quiet and the price was right. Rated 1 out of 5 by Aggrevated from We’ve owned this fridge for 8.5 years. At first it was great, but then on year 3 things went sout... We’ve owned this fridge for 8.5 years. At first it was great, but then on year 3 things went south. We have a recurring problem: the fridge gets warm while the freezer freezes things rock hard (ice cream). Basically I’ve read/ been told this is caused by vent blockage where the air can’t flow from freezer to fridge.This can be caused by many factors... too much stuff in freezer/fridge (not ours) doors left open too long (possibly once or twice for us) food particles clogging tube (not ours) vent fan stops working ( we replaced) Anyway, I feel like every single thing that could go wrong with the air flow has. This fridge has stopped working at least once a year, sometimes twice a year since the problem first started. Every time it happens we have to fill coolers with food and ice, decide on what to throw away (waste of money/groceries), unplug it and wait for the ice buildup to melt (at least 24 hours). For ours, the problem has always been ice building up somewhere inside the fridge where we can’t get to. We’ve done everything recommended over the years to fix the problem. It just happened again for no apparent reason. We are done. My husband wants to take an axe to it. Rated 4 out of 5 by Farmgirlmn from Nice refrigerator but lacking freezer space We have had the black stainless steel version of this refrigerator for just over a week now. It seems to be a good refrigerator for the price. We bought it after reading extensive reviews and finding this model had received high praise on CNET for how well it held temperatures.We like that it has adjustable half-width shelves and a deli drawer. The LED lights make it very easy to see everything, and all of the shelves are transparent so no sauce packets can hide in a corner somewhere. Strangely, it does not have a butter/dairy compartment -- you would not think that is a big deal, but it does take some getting used to. It is a bit loud, but our old fridge was too, so for us it doesn't matter. If there is anything we are disappointed with, it would be the freezer space and design. We are still getting used to the bottom freezer drawer. We had a bottom freezer before, but with a door, and this new model has much less freezer space because of the drawers. I used to be able to stock up on items in our old freezer, but this one does not have the space. The drawer sometimes pulls out unevenly, but it closes firmly and easily, which is nice. We did not hook up the ice maker, so I can't comment on it other than to say that there is a wire that sticks out when you have the ice maker in the 'off' position, which seems a bit in-the-way. The drawer is convenient in that you don't have to bend down and reach in and under to get things, but I'm not sure that is worth the tradeoff of less space. Watch the dimensions. This refrigerator had the same stated dimensions as our old fridge but is actually wider, and almost didn't fit in our 33 in. opening. It is also taller than expected, even though we measured our openings several times to verify. We actually had to remove a bottom decorative panel from the cupboards above to make it fit. So best if you have extra space and aren't expecting a tight fit. 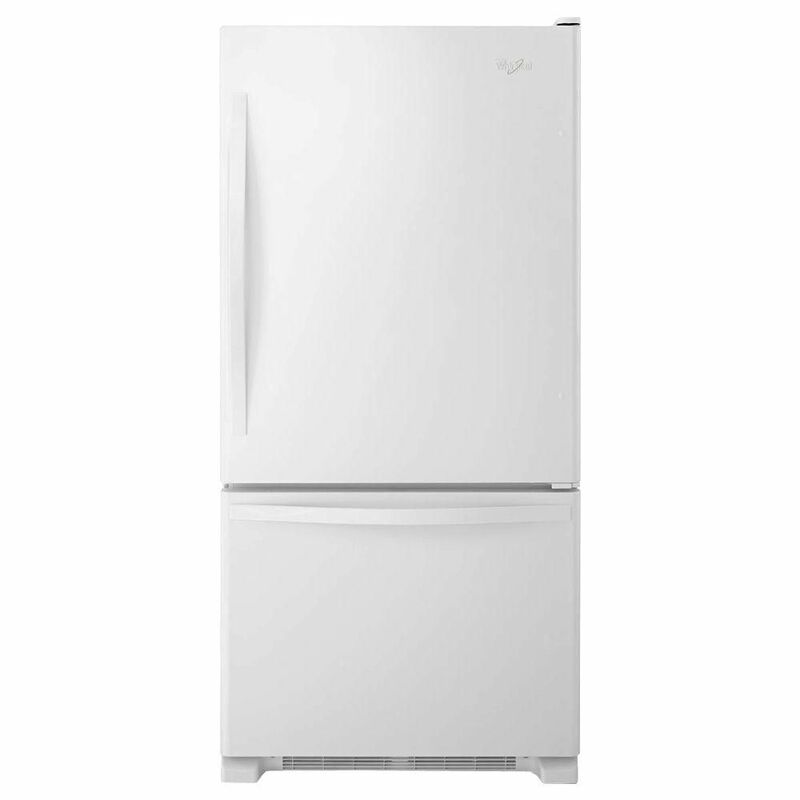 Rated 4 out of 5 by Sharon from I really like this refrigerator because it is right at... I really like this refrigerator because it is right at my level when I open the door. There seems to be more space for milk and juice containers. It was hard shopping for a fridge but the fact that Whirlpool is made in America sold me on this one.